myoldmac.net - Invicta · Electronic Master Mind · 1977 - Buy it! Nice version of the Electronic Mastermind by Invicta, UK - 1977. Tested in good condition, nealy no signs of use - please see the photos. Including some number sheeds, no battery included. This is a game where the machine selects a sequence of up to 5 random digits which are not shown. The player enters a guess of 5 digits which are displayed. When the [TRY] key is pressed the machine displays how many of the entered digits are the same as those it has selected, and how many are the same and in the same position. 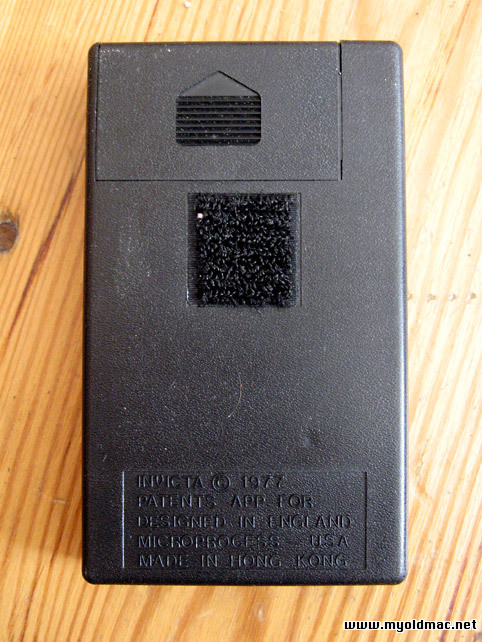 "Invicta Plastics" is a British manufacturer of plastics products and toys. Master Mind was invented in 1970-71 by Mordecai Meirowitz, an Israeli Postmaster / Telecommunications expert. His idea was at first turned down by many of the leading toy companies, but he persisted, and took it to the International Toy Fair at Nuremberg in February 1971, where he showed it to a small English company, Invicta Plastics Ltd. The small Leicester based company bought up the entire intellectual property rights to the game, and under the guidance of it's founder Mr. Edward Jones-Fenleigh, refined it, and released it in 1971-72. It was an immediate hit, and went on to win the first ever Game of the Year Award in 1973. It also received a Design Centre Award, and the Queen's Award for Export Achievement. Something about this game caught the imagination of the public, and it became the most successful new game of the 1970's. It has sold over 55 million copies in 80 countries around the world. In the fifty years of Invicta`s history, none of its has products has made such an impact on the world as Mastermind. This game of logic was introduced by the company in 1971, and became the fastest selling game in history at the time. Mastermind is a unique game that is capable of breaking down every cultural, ethnic, religious and language barrier world-wide. 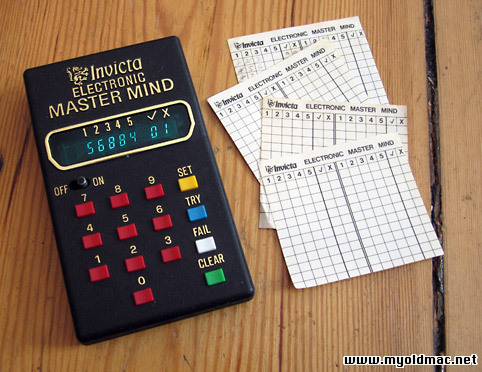 Die elektronische Version des legendären Mastermind Spieles, vom original Lizenzhersteller Invicta aus England. Sehr schöne Version in gutem Zustand. Gelegentlich muß man einen knopf zweimal drücken, aber alle gehen und das Spiel ist funktionsfähig. Kommt ohne Batterie. Buy now for 48 € with PayPal, shipping cost within EU are included. All other buyers please contact me. Jetzt Kaufen für 38 € mit PayPal, die Versandkosten innerhalb Deutschlands sind enthalten.